In the 80s, when I was a Metalhead in the beginning of my long life into the genre, I learned that every Metal genre has its own value. All the genres you can think of has many to offer to every Metal fan that wants to be fed with very good music. My earlier conception didn’t change throughout the years, what allowed me to accept and like bands and new Metal genres as time passed by. And a band as the Finnish quintet ABHORRENCE seems to be aligned with this way of thinking, because their EP “Megalohydrothalassophobic” (don’t ask me to spell this name) joins together the past and the present. They play Death Metal with an Old School outfit, but using some musical elements that are different from the usual. Some Groove can be heard in many moments, along with Stoner and modern Thrash Metal touches. And they have a personal way of making music, something unique and that is theirs. We could say that they are in the same way of EDGE OF SANITY and AT THE GATES in their earlier ages, when both bands still had the crude essence of Death Metal. And these guys are good, very good! Jan Rechberger worked on the recording and mixed the EP, and Jaime Gomez Arellano worked on the mastering, so you can expect a very good sound quality. And it combines a clear aesthetics, with everything in their right places, but bearing that essential Death Metal sound essence that we find on classical albums. It sounds brutal and raw as Death Metal demands, but clear and with fine and defined instrumental tunes. The first song, “Intro: The Mesh”, as the name states clearly, is just an introduction. But when “Anthem for the Anthropocene” starts, we can feel that abrasive energy from Death Metal into a slow and grasping song (fines slow tempos and excellent guitars). “The Four Billion Year Dream” shows very good rhythmic changes (so you can expect a fine work from bass guitar and drums) and an excellent melodic touch. But if you prefer something simple and straight, you can bet that “Hyperobject Beneath the Waves” was created for you. And the oppressive and crude insight that guides “The End Has Already Happened” is excellent (very good instrumental technique, and excellent grunts). 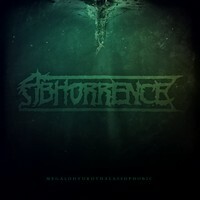 ABHORRENCE is a fine band, and shows on “Megalohydrothalassophobic” that they deserve to release an album.